Laughing my a** off. Mostly because I do this. Not regularly, but on occasion. 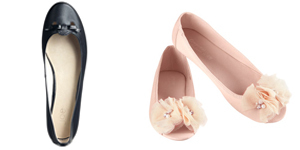 I cannot find a pair of flats that don’t give me blisters. I have tried. So if I have extensive walking to do, out come the sneakers. In my defense: they are grey, not glaring white, and until two days ago, my walk to work was 55 minutes long. but then I don’t even know what business casual looks like. Must get out of my office cave more often. I think we need to clarify by saying we aren’t dissing on a nice pair of Pumas or Converse to a casual office setting, especially for the menfolk. This is like, designated gym sneakers. As in performance footwear with things like air technology and reflective bits. If you would run a marathon in them, you shouldn’t be wearing them to work. Unless you are a professional runner – in which case fill your boots. I’ve been known to do this (with black sneakers) but it’s mainly so I can walk home after work (2 hour walk in dress shoes = not comfy) and to keep my work shoes from getting wrecked. What we really need are comfy platform walking shoes. For us shorties who hem their pants to be worn with 3″ heels. Although flats tend to be less bad for the small of the back and the knees, they are just as bad as heels at encouraging bunyons (aka hallux) because, unlike good trainers or sensible shoes, flats do not provide support to the bones in the middle of your foot. Do not wear flats if you have to walk for any length of time. Let’s face it, most dress shoes are instruments of torture, not much better than the horrible, luckily defunct Chinese tradition of binding women’s feet to make them look tiny and dainty. So, how about getting a pair or three of quality sneakers that blend with your black, anthrazite or navy business suits?